In the first night of the Round 8 of the EuroLeague, three home teams won against theirs opponents. 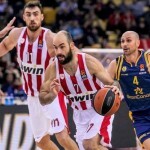 Only Olympiacos won (62 – 72) against Munich, in Germany. In the opening game of the round, Efes was better than Maccabi with a score of 90 – 77, while they neighbours from Istanbul, Fenerbahce, won 100 – 79 against another Turkish team, Darussafaka (also from Istanbul). And Madrid was better than Gran Canaria. The result between these two ACB teams was 89 – 76. In the first EuroLeague match for Ioannis Sfairopoulos as Maccabi head coach, the Greek strategist didn’t find the solution for the excellent Efes in Istanbul. From nine players who managed to score in the home team, six of them had ten or more points. The top scorers were Tibor Pleiss and Bryant Dunston with 14 points, while two other players added 12 points each: Vasilije Micić (the Serbian Point guard also had 8 assists) and Shane Larkin. The Croatian Shooting guard – Small forward Krunoslav Simon ended the game with 11 points and Rodrigue Beaubois finished the match with 10. In the team from Tel Aviv, four players had double-digit score. Jonny O’Bryant was the top one with 19, Alex Tyus scored 12 and Deandre Kane and Scottie Wilbekin scored 10 points each one of them. In the Turkish EuroLeague Derby, Željko Obradović scored his 300th victory in the Euroleague as a head coach. His team counted to 100 against Darussafaka. The Team captain, Melih Mahmutoglu, scored 16 points, Ali Muhammed added 15 and Marko Gudurić, Jan Vesely and Joffrey Lauvergne finished the game with 13 points each one of them. Two players had more than 10 points in Darussafaka: Michael Eric (17 points) and Ray McCallum (16 points). The Only team that played away and scored the win in the first night of the Round 8 was Olympiacos. The Greek squad won with a 10 points difference (62 – 72, as mentioned previously) against the German team from Munich. In Dejan Radonjić’s squad only two players had double-digit score, Vladimir Lučić and Derrick Williams, and both of them finished the game with 15 points. On the other side, in the team from Piraeus, five players finished the round with 10 or more points. Zach Leday scored 12, Nikola Milutinov 11, and Janis Timma, Jānis Strēlnieks and Georgios Printezis added 10 points each one of them. And in the last game of the night, in the ACB Derby, Madrid was better than Gran Canaria (89 – 76, as mentioned before). 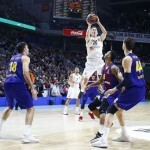 In that match, only in the first quarter the away team was able to lead against the present EuroLeague Champion. That quarter was finished with a 6 points difference for Gran Canaria (22 – 28). But, in the other three quarters, Madrid demonstrated their strength. 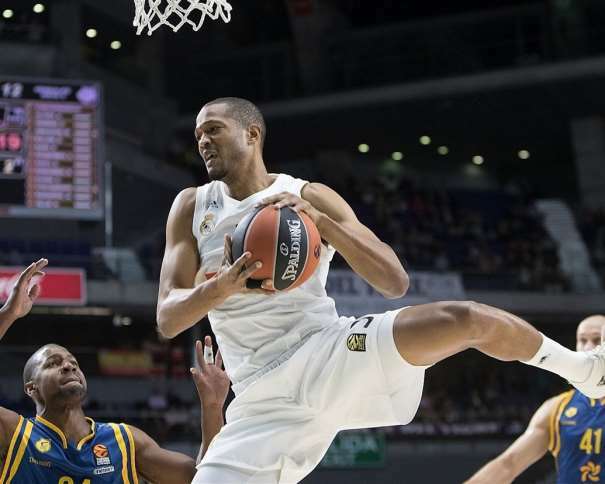 Anthony Randolph was the best with 20 points in the squad from Madrid, while his teammate Klemen Prepelič scored 13. Facundo Campazzo added 10 points. 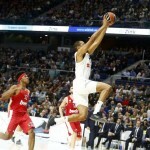 For the guests, DJ Strawberry scored also 20 points as Randolph for Madrid, but it wasn’t enough for his team to celebrate against Pablo Laso’s players. Eulis Baez scored 14 points and, besides Strawberry, he was the only player with more than 10 points for the away squad. After the 8th Round, Madrid is without a loss (with all 8 wins), Fenerbahce has 7 victories and 1 loss, Efes 6 wins and 2 losses, Olympiacos 4 – 4, Munich has 3 wins and 5 losses, Gran Canaria 2 victories and 6 losses and Maccabi and Darussafaka, both, have 1 win and 7 losses. Partizan will play against València, in the 8th round of the EuroCup, in the “Aleksandar Nikolić” Sports Hall (also known as Pionir), in Belgrade. The Belgrade crowd will have the chance to see the best team of the group C and help the home team to play as best as possible against València. Before this game, Partizan lost the two previous matches, the first one in the EuroCup (against Zenit) and the second one in the ABA League, against Budućnost (the Euroleague team from Podgorica, Montenegro), with a score of 75 – 71. And in the game against València, the young team from Belgrade will try to surprise its opponent or, at least, show the energy on the floor. 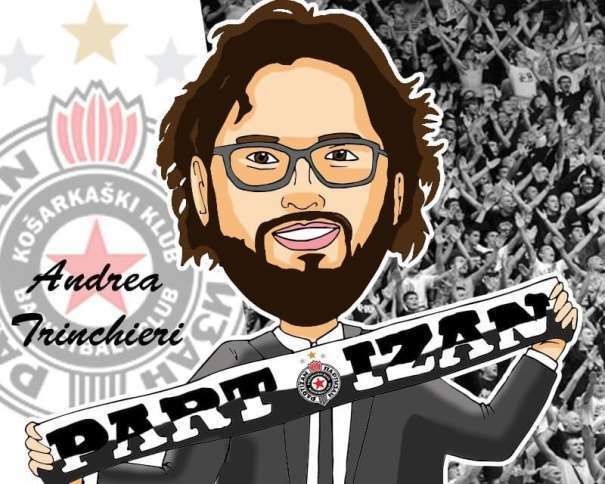 The head coach of Partizan, Andrea Trinchieri, said that the game against València will be tough and interesting. “We are expecting tough, interesting game against an excellent opponent. This will be the 2nd time that these two clubs will play against each other but our history is connected due to players who leaved their signatures in both clubs: Tomašević (Dejan), Milojević (Dejan), Perović (Kosta), Avdalović (Vule), Lučić (Vladimir)… So, this match will be special for both squads”, said Trinchieri about the game in the 8th round of the EuroCup. Rade Zagorac, who will wear a protecting mask in the match against València due to his broken nose, said that València is one of the best teams in the group. “València is one of the best, or maybe the best, team in our group, but that doesn’t mean we will let them win easily. In the first game against them, when we were guests, we played well and now we will play in front of our fans. They came in Belgrade after tough loss in their championship, so we are expecting to see their reaction after it, especially because all teams are motivated to play in the atmosphere we have here in Pionir. We have a lot of time to rest and get ready for this match. We will try to win”, said Partizan small forward – shooting guard.